This week I decide to pull out a UFO and see if working on that will spark some good ol’ quilting mojo. I’ve been in such a funk lately, I need something to kick start my desire to get back into quilting. You can read about ‘Whirled Peas’ here. 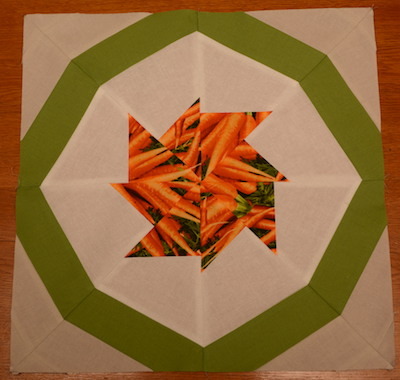 It’s a paper pieced block that will feature a veggie or fruit in each block. Today I finished a carrot block. Here’s hoping for a week full of paper piecing. And maybe some FMQ on Chic Country too. Quick weekend trip to PA to assist Dad in settling in to new assisted living apartment. ✔️ Dad’s all settled in. Apartment looks nice. Mark some blocks for FMQ on Chic Country, maybe even quilt them. ✔️Marked, and quilted a few too! This entry was posted on Tuesday, September 4th, 2018 at 20:02	and is filed under Quilting. You can follow any responses to this entry through the RSS 2.0 feed. You can skip to the end and leave a response. Pinging is currently not allowed. Hi, Sharon! 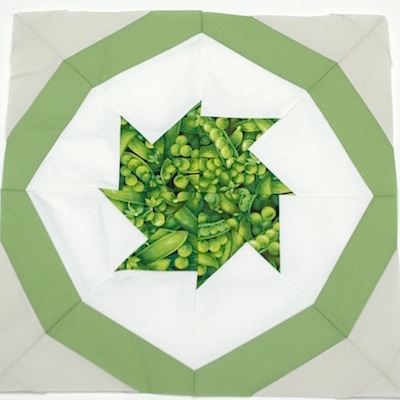 I love the whirled peas and the carrots block! I understand needing something to kick start the quilting sewjo. For sure!